The Three Halls of Stockport is a self-navigating race that only fixes the start, finish and three checkpoints. There is no mass start; you just rock up, pick up your chip and check-in card (for punching at each Checkpoint) and away you go. Rather more low-key than RSR. You carry a map (provided) and then you’re expected to find your own way. And it’s rude to Google(maps). I saw no-one using a smartphone or iPad to guide their route. 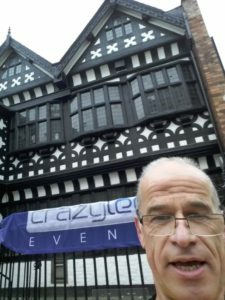 Each year the organisers, ‘Crazy Legs Events’, choose three different Halls – rather like our own Mr Pegg choosing from the selection of pubs or gas lamps in our own city. I went wrong three times and it cost me an extra-long set of steps up, a stop in Market Place to think, and extra 0.4 miles to correct on the second leg. I had used Strava the night before to learn about Stockport town centre because I’d only ever been there once before, and that was to visit the Hat Museum! 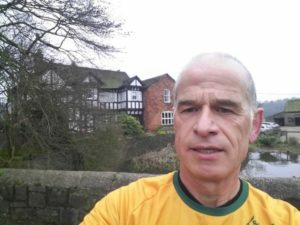 I came away from Checkpoint 1 (at Underbank Hall – a fabulous Tudor black and white timber building) and reached the big church – and remembered a path that cut off a corner. Foolishly I took it and dropped 40 or so steps down to the river level. I’d later have to climb a different set of 40 to gain the front of Vernon Hall & Park at Checkpoint 2. Underbank Hall – actually is used as a bank but the name is from being below the bank made by the River Mersey. Goyt Hall is a farmhouse out of the town. After Vernon Park (host to Cross Country) I took a nice riverside path, like running up the higher stretches of the Porter. I decided to miss out the slow, slippery zig-zags at the river crossing by taking a steep bank down to the bridge. Mistake number 2 – the bank was not giving and forgiving mud, but hard and scarily slippery sandstone. I got dirty and maybe saved 15 seconds. Vernon Hall and Park, Checkpoint complete with water and Brownies. My route came back over the same bridge and back up the steep bank again. At the top I turned a different way to two runners I had caught; they were local, and I was suddenly worried! A medal, a large cuppa and some hot food for every finisher. 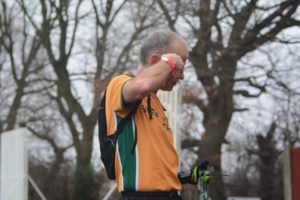 Because of the staggered start I didn’t know how I had done until I picked up the results on Sunday afternoon – but, as I’d assumed, it wasn’t necessary for me to wait around to collect a prize. 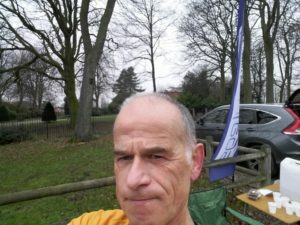 The prizes are for fastest (not first) finisher, not fastest pace or shortest route – but running further than you strictly need to is not a great idea. I thought it was brilliant, but as I’d like to go back and run 2020’s version (3 more Halls) could you all forget this report and leave me to take one of the limited-to-200 places? Thanks. There were 157 finishers with the slowest runner taking 2 hours 40 minutes.